The 2015 Jeep Renegade certainly lived up to its name as photos of it have leaked onto the Internet, originating from Jalopnik, ahead of the Geneva Auto Show. This much anticipated crossover, originally rumored to be called the “Jeepster,” is set to enter a highly competitive market of established models in the crossover class. This new Jeep will likely be based on the FCA’s Small Wide platform architecture, as well as come standard in front-wheel drive. This particular model, the Renegade, will be manufactured for on-road and soft-road driving capabilities. We may find some irony in the title that it is, in some ways, a renegade of the traditional Jeep line that historically has its roots embedded in off-road capabilities. Just like the Cherokee has the Trailhawk, the automaker might have plans lined up for a “Trail-Rated” version of the Renegade. While there is no official release regarding the crossover’s powertrain, industry experts predict the vehicle will come standard with a 1.4-liter turbocharged engine coupled with a six-speed manual transmission that produces 160 horsepower and 181 lbs-ft. of torque or a 2.4-liter MultiAir Tigershark engine to crank out 184 horsepower and 171 lbs-ft. of torque. 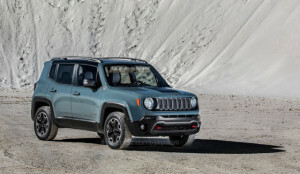 No matter the engine, this Renegade will certainly appeal to a large audience of consumers who want the Jeep’s reliability in a package that is intended solely for the road. At the same time, it appeals to traditional Jeep enthusiasts who enjoy the spirited driving of manual transmission, a classical Jeep characteristic. It won’t be much longer now as the 2015 Jeep Renegade will grace the stage in the coming days at the Geneva Auto Show. Daylight Savings 2014: Reset Your Clocks!